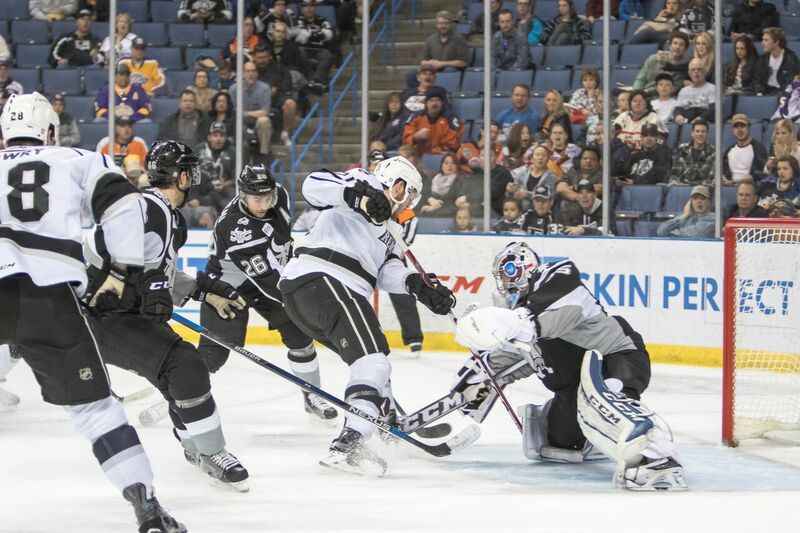 Brett Sutter scored twice and the Ontario Reign (37-14-4-1) rallied to defeat the San Antonio Rampage (24-33-8-0), 5-3, in front of a sellout crowd of 9,491 on Friday night at Citizens Business Bank Arena. Jonny Brodzinski added a goal and two assists, while Justin Auger had a goal and an assist. The Rampage struck first in the opening period when Sam Henley scored on a deflected shot over netminder Peter Budaj at 1:41. With seven minutes remaining in the frame, Borna Rendulic took a feed from the corner and buried the puck into the net to extend the Rampage lead. The Reign tried to generate offense any way they could, ultimately leading in shots, 9-6, but trailed 2-0 at the end of the first 20 minutes. Ontario turned the game around at 8:03 of the middle stanza when Kris Newbury banked a quick pass up the ice to Auger, who buried a wrist shot from the left side to put Ontario within one. The Reign played with pace the rest of the night as Sutter evened the score, banging home a shot from the inside circle with 1:20 remaining in the period. The Reign continued to make an obvious push in the final frame, and Brodzinski found the back of the net on the power play at 3:53. Less than two minutes later, Ontario responded with another goal, Sutter’s second of the night with help from Nic Dowd and Auger. At 6:59, forward Sean Backman recorded a goal of his own to cap the Reign scoring. Budaj earned his AHL-leading 35th win of the season with 19 saves. Rampage goaltender Roman Will made 27 saves before being pulled in favor of Spencer Martin.